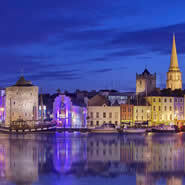 Waterford has a rich vibrant culture and heritage and Waterford City and County Cultural Services support and share aspects of this rich resource. Our Archives, Arts, Conservation, Heritage, Oifigeach Gaeilge and Library Services work together and with local communities and organisations to support and promote our heritage and culture and to share this resource with locals and visitors alike. Find out more about these services using the navigation list. Exhibitions from our cultural services are available on our Online Digital Exhibitions portal. Tá cultúr agus oidhreacht shaibhir ag Port Láirge agus tugann Seirbhísí Cultúrtha Chathair & Chontae Phort Láirge tacaíocht don achmhainn luachmhar seo trí ghnéithe di a roinnt leis an bpobal. Oibríonn na Seirbhísí Cartlainne, Ealaíona, Caomhantais, Oidhreachta, Gaeilge agus Leabharlainne i gcomhar lena chéile agus le pobail agus eagraíochtaí áitiúla chun tacaíocht a thabhairt d’ár n-oidhreacht agus d’ár gcultúr agus chun í a roinnt le muintir na nDéise agus le cuairteoirí araon. Is féidir a thuilleadh eolais mar gheall ar na seirbhísí seo a fháil tríd an liosta nascleanúna.